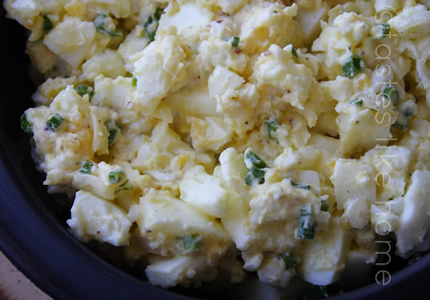 Thank you Cynthia, with tasteslikehome.org, for this simple egg salad recipe. Add just enough mayonnaise to make it creamy, but not runny. Add all the ingredients except the green onions/scallion to a bowl – mash and mix. Do not over mash, you want the eggs to have some texture.